The GORE® VIABAHN® Endoprosthesis with Heparin Bioactive Surface* and the GORE® VIABAHN® VBX Balloon Expandable Endoprosthesis have been proven to address the treatment challenges in complex IOD. Mwipatayi BP, Sharma S, Daneshmand A, et al; COBEST co-investigators. Durability of the balloon-expandable covered versus bare-metal stents in the Covered versus Balloon Expandable Stent Trial (COBEST) for the treatment of aortoiliac occlusive disease. Journal of Vascular Surgery 2016;64(1):83-94.e1. Mwipatayi BP, Thomas S, Wong J, et al; Covered Versus Balloon Expandable Stent Trial (COBEST) Co-investigators. A comparison of covered vs bare expandable stents for the treatment of aortoiliac occlusive disease. Journal of Vascular Surgery 2011;54(6):1561-1570. Sabri SS, Choudhri A, Orgera G, et al. 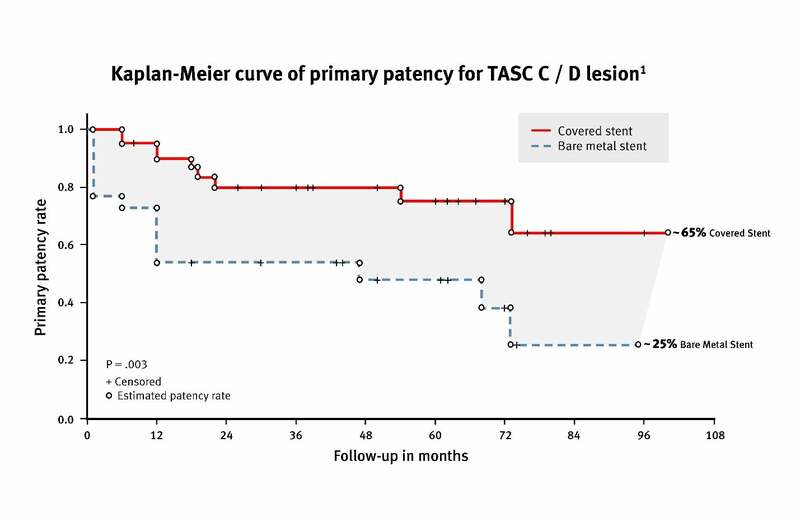 Outcomes of covered kissing stent placement compared with bare metal stent placement in the treatment of atherosclerotic occlusive disease at the aortic bifurcation. Journal of Vascular & Interventional Radiology 2010;21(7):995-1003. Piazza M, Squizzato F, Dall’Antonia A, et al. Outcomes of self expanding PTFE covered stent versus bare metal stent for chronic iliac artery occlusion in matched cohorts using propensity score modelling. European Journal of Vascular & Endovascular Surgery 2017;54(2):177-185. Chang RW, Goodney PP, Baek JH, Nolan BW, Rzucidlo EM, Powell RJ. Long-term results of combined common femoral endarterectomy and iliac stenting/stent grafting for occlusive disease. Journal of Vascular Surgery 2008;48(2):362-367. Jongkind V, Akkersdijk GJ, Yeung KK, Wisselink W. A systematic review of endovascular treatment of extensive aortoiliac occlusive disease. Journal of Vascular Surgery 2010;52(5):1376-1383. Indes JE, Pfaff MJ, Farrokhyar F, et al. Clinical outcomes of 5358 patients undergoing direct open bypass or endovascular treatment for aortoiliac occlusive disease: a systematic review and meta-analysis. 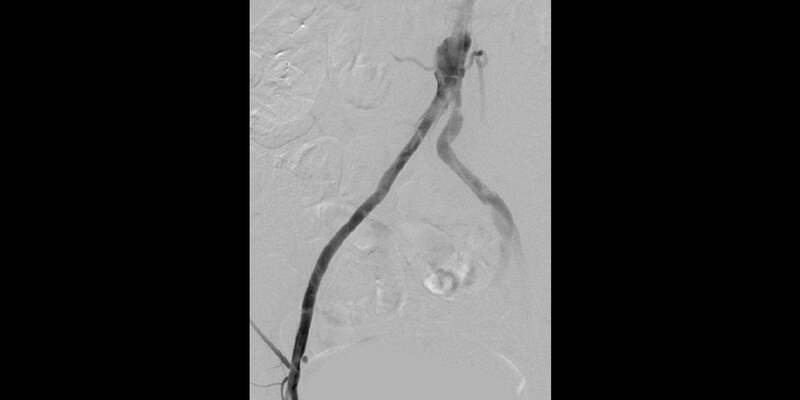 Journal of Endovascular Therapy 2013;20(4):443-455. Society for Vascular Surgery Lower Extremity Guidelines Writing Group; Conte MS, Pomposelli FB, et al; Society for Vascular Surgery. Society for Vascular Surgery practice guidelines for atherosclerotic occlusive disease of the lower extremities: Management of asymptomatic disease and claudication. Journal of Vascular Surgery 2015;61(3)Supplement: 2S-41S.e1. Lammer J, Dake MD, Bleyn J, et al. 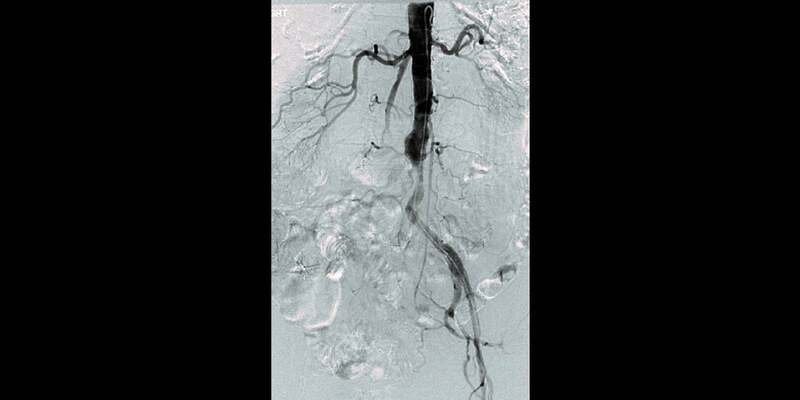 Peripheral arterial obstruction: prospective study of treatment with a transluminally placed self‑expanding stent graft. Radiology 2000;217(1):95-104. GORE® VIABAHN® VBX Balloon Expandable Endoprosthesis [Instructions for Use]. Flagstaff, AZ: W. L. Gore & Associates, Inc 2016. MD148076.